Click the link above to read the full story. 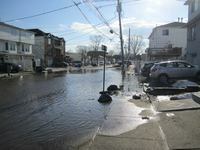 The U.S. Senate voted Thursday to delay planned increases in flood insurance rates that many homeowners along the coasts of New Jersey and New York have said would price them out of their homes. The Homeowner Flood Insurance Affordability Act passed the Senate 67 to 32, but it faces substantial opposition from the the House of Representatives and the White House. The rate increases were part of reforms passed in 2012 when Congress worried about the financial stability of the National Flood Insurance Program, a system that is run through the Federal Emergency Management Agency and insures 5.5 million homeowners. FEMA says roughly 20 percent of policyholders pay below-market rates that do not reflect their true risk of flooding. They either have seen their premiums go up already or will face hikes soon unless the law is rolled back. and create an ombudsman within FEMA to help policyholders with disputes about their flood risk. Menendez's bill would not affect second homes or properties that have seen repetitive flooding. Rates for those policies would go up according to the 2012 legislation. Mayor de Blasio On Wife Chirlane McCray: "She's The Most Important Voice In My Life"
A recent Quinnipiac University poll asked voters whether a mayor’s spouse should have a policy making role at City Hall. Only 27% said the spouse should play that role.De Blasio, however, remained unphased about New Yorkers questioning the arrangement. "I think most people in New York City get that [she's my partner] and appreciate that and are going to find out it's very productive to getting things done in this city,” he said. Allan Shweky's pin on Pinterest. WHEN it comes to apples, I've always preferred tart, crisp ones like Granny Smiths or Idas to McIntoshes. It seems to me, therefore, that as a new name in Apple Computer's growing orchard of machines one of those would have done admirably. What could sound more ''user friendly'' than a Granny Smith computer around the house. Then again, maybe Apple had hamburgers on the mind in naming its new computer - in hopes of its Mac becoming as much a part of the American mythos as the golden arches are. Names, and their concomitant marketing strategy, aside, today's launching of the Macintosh by Apple, unlike I.B.M. 's recent introduction of the rather unexceptional PCjr, presages a revolution in personal computing. Like all major innovations, this one entails a high risk of failure. Apple lost the first battle, begun with its $10,000 Lisa. The second assault is with a machine only a fourth the cost of its big sister and almost as versatile. One computer the Mac definitely cannot be compared with, though many people will try, is the PCjr. That would be like comparing apples and peanuts. It just cannot be done. The PCjr is a more limited product offered at a lower price. The only real connection between the two machines is that the introduction of both computers was anxiously awaited for what seems a decade. The roughly 17-pound Macintosh comes in a square bushel-basket-size canvas tote bag with an oversized zipper. The preproduction version I saw did not sport the Apple-with-a-bite logo. The addition of this emblem could well turn the bag into a classic status symbol, and even if the computer stayed home, the bag would accompany people on the move, stuffed with picnic goodies or laundry. As to the computer itself, unpacked, it sits like a towering, square, robotic Cyclops, its single disk drive an off-center mouth. The machine definitely has personality, though its high profile, designed, no doubt, to reduce the amount of desk space needed, is a bit startling. Everything we always wanted to know? And yet it’s impossible to forget. The daunting question on everybody’s mind can finally be answered thanks to the city’s latest resource — the Rat Information Portal, known affectionately as R.I.P. The interactive online map allows users to find out how many furry friends are lurking around by searching an address, intersection, block number, neighborhood, borough or zip code. But before you jump on the site (we know you will), there’s some terms used on the R.I.P you should be familiar with to properly evaluate your rodent situation. The portal gets pretty detailed, not only disclosing how many rats live in an area, but going as far as enlightening you on the active rat signs: fresh tracks, fresh droppings, active burrows, active runways and rub marks, fresh growing marks, and LIVE RATS! If you’re not already alarmed by the search results for your neighborhood, keep in mind that there’s most assuredly more hidden rodents than shown on the map. The R.I.P. only shows rats and rat evidence uncovered during city inspections and doesn’t report individual rat sightings. Plus, when they’re not scurrying through your trash or hiding in your favorite gym bag, those critters can be pretty sneaky. The NYC Department of Health and Mental Hygiene’s tool is sure to spark some interesting conversation. Who doesn’t want to compare how many fresh tracks and droppings are in their area? Now, instead of awkwardly commenting on the weather or asking “how ’bout them Yankees?” when an uncomfortable silence strikes, you can bring out the zinger, “so how many live rats live in your building? 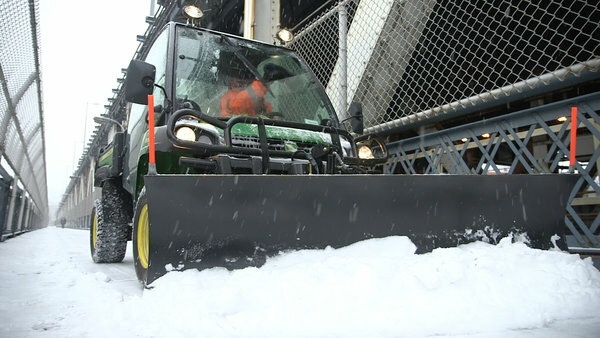 Mayor Bill de Blasio may have said that his sanitation department could have done moreto remove snow from Upper East Side streets after Tuesday’s storm, but at least one Brooklyn councilman thinks the mayor should not be apologizing to the tony neighborhood. Among council members, reactions to the city’s snow removal efforts have somewhat reflectednew divisions created by a bitter race for council speaker. Early supporters of the new de Blasio-backed speaker, Melissa Mark-Viverito, have generally declined to vocally criticize the administration for an allegedly slow response, while those who did not support her early on have been more willing. That includes Manhattan’s Dan Garodnick as well as Staten Island’s Vincent Ignizio, who both took to Twitter to document what they described as a sluggish response. Mr. Greenfield, like many council members, as well as the new mayor, had blasted former Mayor Michael Bloomberg back in 2010 when a post-Chirstmas blizzard left many streets clogged with snow and ice for days. Yesterday, he again tweaked Mr. Bloomberg while praising his successor. “I’m joking, half joking, perhaps,” he quipped. Court papers say Vincent Asaro, 78, of Howard Beach, took part in “several planning meetings” with the caper’s mastermind, James “Jimmy the Gent” Burke, portrayed by Robert De Niro as Jimmy Conway in the 1990 film. Borough President Eric Adams detailed a comprehensive, progressive vision for Brooklyn at his inauguration event Sunday, unveiling his agenda to grow the borough’s economy and improve quality of life for all Brooklynites, as well as calling on citizens to aid in the cause by joining Team Brooklyn. US Senator Chuck Schumer, Mayor Bill de Blasio, Congresswoman Nydia Velazquez, Council Speaker Melissa Mark-Viverito, Police Commissioner Bill Bratton and other dignitaries introduced Adams and his plan for the borough at the Brooklyn Museum, with hundreds of local leaders and guests representing all of Brooklyn’s communities in attendance. Acclaimed actor Jeffrey Wright emceed the event. Adams made clear his priorities for Brooklyn, saying the borough must continue to grow its economy while dealing with stark inequalities in wealth, services and opportunity. @nyrrnews: NEWS ALERT: @nyrr #BrooklynHalf sells out in 48 hrs. Looking forward to seeing approx. 25,000 runners cross the finish line in #ConeyIsland. New mayor Bill de Blasio and his new NYPD commissioner Bill Bratton are threading a delicate needle as they try to increase the focus on pedestrian safety without officially cracking down on jaywalking, which as any New Yorker will tell you is basically a way of life here. De Blasio insisted on Monday that "there is no larger policy in terms of jaywalking, and ticketing and jaywalking," after police bloodied an 84-year-old man as they ticketed him for jaywalking Sunday. But, he said, "It is something a local precinct commander can act on, if they perceive there to be a real danger." Those local commanders are indeed acting; as The Wall StreetJournal reported on Wednesday, the city has seen a major spike in jaywalking citations this year, issuing 64 compared to just 12 in the same period last year. Many of those citations were issued at one location: The intersection of 96th Street and Broadway, where three pedestrians have been killed so far this year,The Journal noted. "On Sunday, an increased number of NYPD officers patrolled the intersection, issuing five traffic tickets to vehicles and citing 18 pedestrians for jaywalking, the NYPD said." But the department offered no explanation for the increase, saying the numbers tended to change depending on traffic patterns. In this city of 8.3 million, police only issued 630 jaywalking in all of 2013, The Journal reported. That is incredibly low compared to the number of people one can observe, in any given trip outside, crossing in the middle of the block or against the light. Many of us probably committed 630 individual acts of jaywalking all on our own last year. The latest citation statistics would appear to support some City Council members' criticism of the perceived crackdown on Monday, when Councilman Mark Levine complained, "To go from no enforcement to this aggressive action was overkill." Indeed, for New Yorkers accustomed to ignoring the lights while on foot, pretty much any citations for jaywalking are going to feel like a crackdown. Anthony M. Armstrong, principal of Middle School 74 in Bayside, Queens, was having a miserable morning. He was groggy from a night of worrying about slippery sidewalks, and a tire on his Chevrolet Equinox had nearly gone flat on his way to work. When he finally made it to school at 7:10 a.m. on Wednesday, there was another surprise: More than half of his 100 teachers did not show up. So Mr. Armstrong scrambled, turned on the Disney movie “Brave” in the auditorium and instructed teachers to use class time to review concepts. Across New York City on Wednesday, schools grappled with anemic attendance and complaints that the city had erred by holding class on a day of subzero wind chills and icy streets. By late afternoon, only 47 percent of students had shown up for class, the Education Department said. Despite the poor showing, Mayor Bill de Blasio defended his decision to go forward with classes, which the city announced after 11 p.m. on Tuesday. 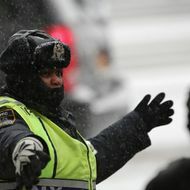 After a foot of snow hit New York City overnight, travelers complained of canceled journeys and uncleared streets. In his first major test the new mayor, Bill de Blasio, defended the city's response. “We only close schools when it is absolutely necessary,” Mr. de Blasio said at a news conference. But many teachers, principals and parents did not see it the mayor’s way. “It’s too messy outside for the kids,” said Adella Sanchez, 40, after she bear-hugged her son, Alex Alago, 8, outside Public School 88 in Ridgewood, Queens. L.A. Santiago, a crossing guard manning the corner of 195th Street and Jerome Avenue in the Bronx, said parents had complained constantly throughout the morning. In a break with tradition, the Archdiocese of New York, which usually follows the city’s lead on snow days, ordered its 98 elementary schools to shutter. Educators felt “the children would not really be getting anything out of the school day if they were to come in,” said Joseph Zwilling, a spokesman. The delicate politics of snow days have stymied New York City officials for years. Calling off classes is a sure way to win the hearts of students, but it can draw the wrath of parents suddenly in need of last-minute child care. Former Mayor Michael R. Bloomberg was criticized in 2004 for canceling classes in anticipation of a storm that turned out to be relatively mild (the high was 30 degrees). In 2009, he came under fire again for declaring a snow day at 5:40 a.m., leaving little time for parents to make child-care arrangements. Since 1982, the city has canceled classes 10 times because of snow; they have also been canceled for hurricanes, including a full week afterHurricane Sandy in 2012. 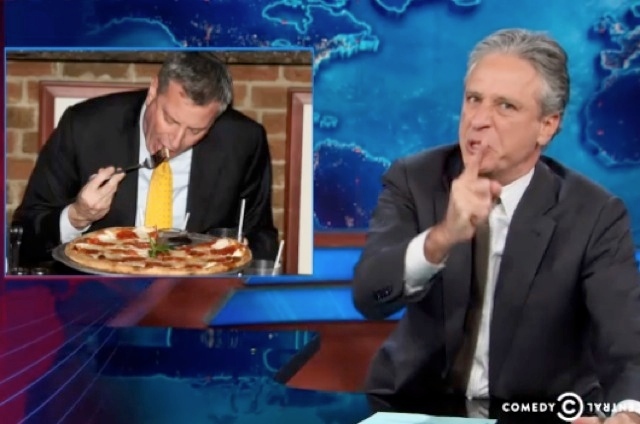 Mr. de Blasio’s first test came when a storm struck a few days after he was sworn in as mayor. The mayor declared a snow day, citing especially frigid temperatures. "After three decades, Dennis Thomas’s winter Sundays are no longer shocking. They are just cold. From November to April, Mr. Thomas, 59, charges into the Atlantic Ocean, along with other members of the Coney Island Polar Bear Club; he has been the group’s president for five years. This year, the club’s premier event on New Year’s Day drew 2,000 swimmers and 6,000 spectators and raised $65,000 for children with serious illnesses. On any given Sunday, 80 to 100 members show up at the New York Aquarium for the frosty frolic — neoprene bootees allowed. The lowest water temperature recorded for a swim was 32 degrees one February. Mr. Thomas, the director of global branding for the technology company SAP, lives alone in Greenpoint, Brooklyn. He suspects that his 25-year-old daughter thinks he is crazy." Check the twitter feed sidebar for more on this story. The city Department of Transportation doesn’t want to give up bike-share racks at The Plaza hotel — months after the landmark building filed a lawsuit to get rid of them. The attorney for the Central Park South hotel said he had thought he was nearing a deal on the bright-blue Citi Bike station, but accused the city of backing out. “There were settlement discussions with the hope of a different setup, but the city recently and most unfortunately terminated them,” lawyer Steve Sladkus told The Post. Sladkus said he was hoping for a settlement at the end of December. But in early January, city lawyers told him there would be no deal. He said he got no response when asked why the discussions ground to a halt. “It’s a shame that they’ve drawn their iron curtain. 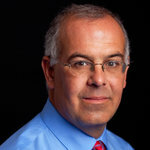 The turnaround seems awfully fishy,” said Sladkus, who has represented other well-off New Yorkers against Citi Bikes. The city Law Department and DOT wouldn’t comment on the purported settlement plan. A Law Department spokeswoman said the city would file court papers in opposition to The Plaza’s petition. “We are confident the court will uphold the placement of the Grand Army Plaza Station as rational and appropriate, allowing this popular station to remain in place,” she said. City Hall’s alleged U-turn came shortly after the arrival of Mayor de Blasio, who has vowed to expand bike lanes and the Citi Bikes program into the outer boroughs. De Blasio’s new DOT commissioner, Polly Trottenberg, who starts work Tuesday, is also a fan of bike sharing. Trottenberg, who worked on policy for the federal Department of Transportation, hailed DC’s bike program when it rolled out in 2010. Still, one city official told The Post the de Blasio administration has not had an effect on the Citi Bikes cases. Similar lawsuits against Citi Bike have deflated. Last fall, a Manhattan judge tossed a Soho group’s suit against bike-share racks in Petrosino Square, a tiny park known for its public art ­installations. Residents of a West Village co-op also lost their case, which claimed the Citi Bike racks blocked sanitation trucks and emergency vehicles. The TD Five Boro Bike Tour splashes the color green from its sponsor's signature green and white logo on all of its promotional materials for the annual bike event taking place this year on May 4. But the 40-mile ride—registration opens on Tuesday at noon—will be taking green to another level in 2014, becoming the first major, sustainable sporting event in New York. Its organizer, Bike New York, is seeking certification from the Council for Responsible Sport, which has certified the Chicago Marathon, a PGA tour in Phoenix and several Olympic trial events for reducing their environmental impact. For the 32,000 participants in the TD Five Boro Bike Tour this will mean some changes. The rider identification system now includes three elements: a reusable fabric helmet cover, a recyclable Tyvek bib (similar to what marathon runners wear) and an environmentally friendly bike plate made out of mineral powders derived from stone. Gone are the loose-fitting vests that riders presumably discarded afterwards and stickers that were affixed to riders' helmets and bicycles. "This is just the right thing to do," said Kenneth Podziba, chief executive of Bike New York. "Bicycling is a sustainable means of transportation and we are constantly trying to reduce our carbon footprint." In addition, Bike New York is adding a composting program at every rest stop during the ride and the t-shirts it hands out to its 3,000 volunteers will all be made from organic materials, costing approximately $3,000 more, according to Keith Peters, executive director of the Council for Responsible Sport. Altogether, these efforts will cost Bike New York "tens of thousands of dollars more" said Mr. Podziba. The cost to participate in the event is also rising nearly 5% to $90. But Mr. Podziba said the increase is not related to the extra certification cost. "Every year it goes up a little bit," he said. Demand for Bike New York's free bike education programs has also increased over the past year since the Citi Bike share program launched. More than 15,000 people—or 3,000 more than previous years—signed up for bike education last year, according to Mr. Podziba. If only Teddy could talk. Then we would know what he thinks of the politicians and activists and drivers who argue about his future. He could expound on Manhattan traffic, its pollution, the cold, the heat, the hay and the shrieking girls clutching dolls who pet his nose on Grand Army Plaza. 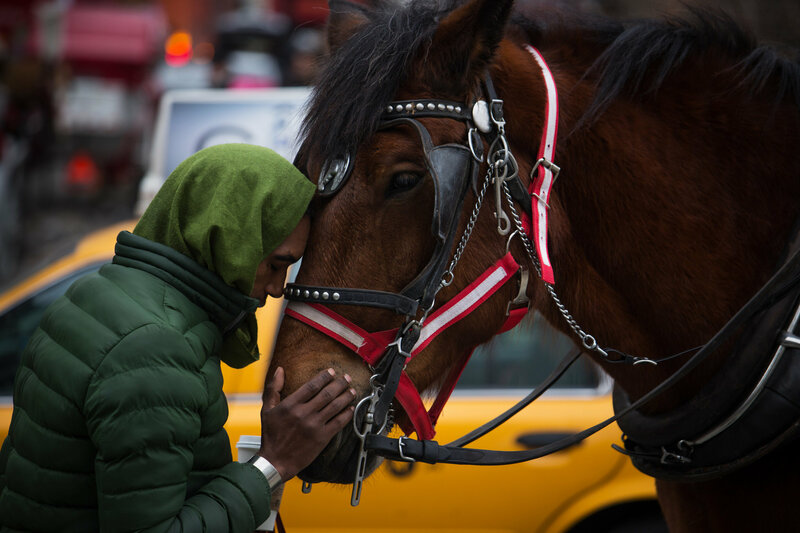 Teddy is 11 years old, a Percheron-cross draft horse from Pennsylvania’s Amish country — a pinto with a coat the color of warm cocoa and whipped cream. He has blinders on. 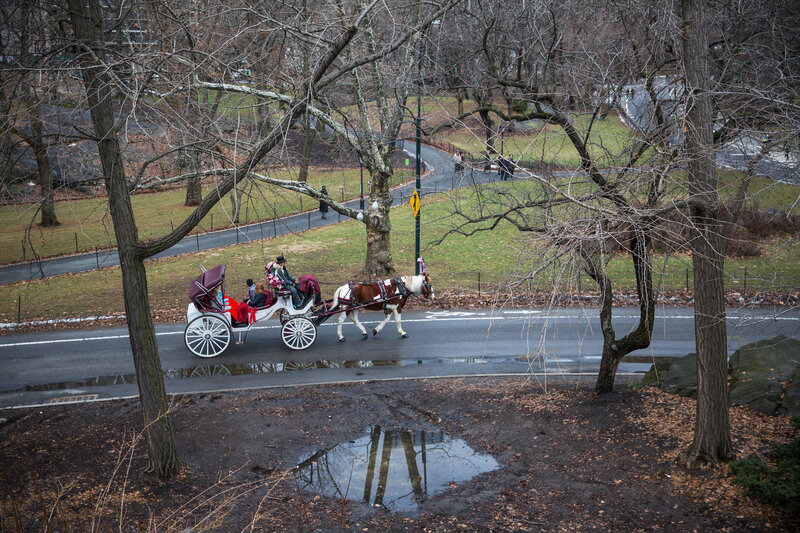 But even those in the know cannot foresee how long it will take for Mayor Bill de Blasio to fulfill his campaign promise to banish the Central Park carriage horses as his first legislative act. The City Council, now led by the sponsor of a 2010 bill to ban horse-drawn carriages, Melissa Mark-Viverito, has yet to discuss the issue. 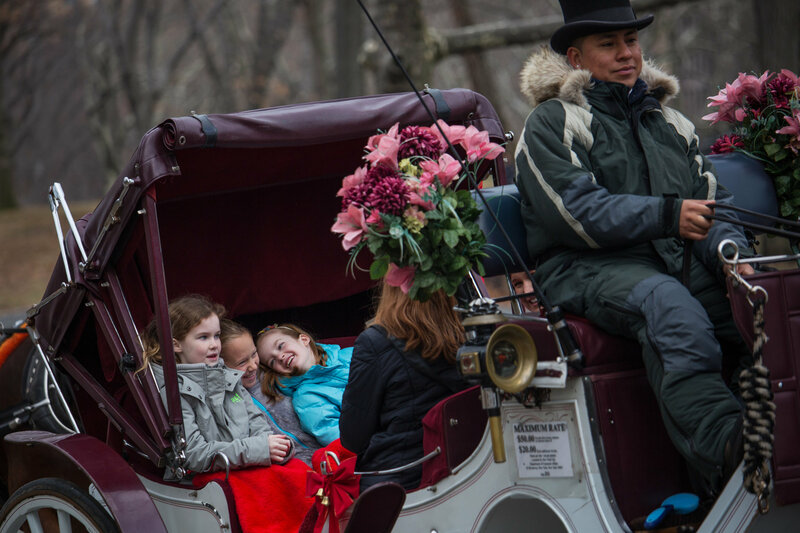 Activists who want to end the carriage-horse trade contributed more than $1.3 million to help elect Mr. de Blasio and council members who supported a ban with a solution: Replace all the horses with a fleet of antique-styleelectric cars to serve tourists, not just in Central Park, but all over the city. 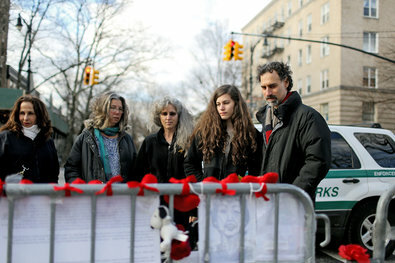 An anonymous Park Slope woman may have had enough of the flowers and teddy bears marking the spot on Prospect Park West where 12-year-old Sammy Cohen Eckstein was killed by a driver last October, but the DOT erected the most gratifying memorial of all on Friday: Signs officially declaring the speed limit lowered from 30 mph to 25. DOT spokesperson Nick Mosquera said yesterday that the agency has "greatly expanded our fight against speeding across the city using the introduction of speed cameras near schools, which the Mayor announced are now issuing violations instead of warnings, expanding neighborhood slow zones and through education campaigns. 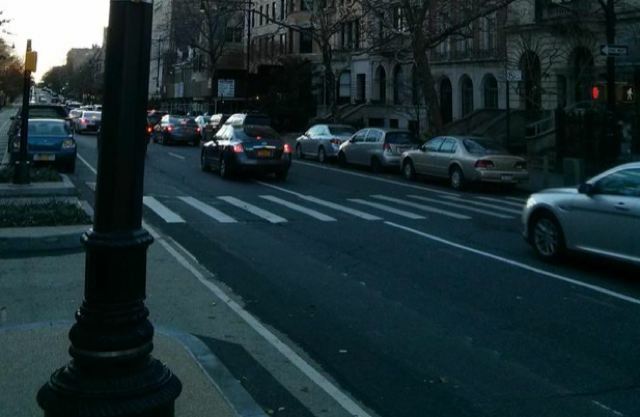 On Prospect Park West, the speed limit is being lowered as a safety measure following an evaluation of the corridor. Installation of the new signage began today." I can't imagine what motivated the individual who tried to take down the community memorial for Sammy. What I do know is that there is a groundswell of support for immediate action. Sammy's memorial is for him, but it is also a testament to the many families in my neighborhood who are coming together to right this wrong and fight for drivers to be careful and slow down. And it has made an impact. Today, the Department of Transportation reduced the speed limit on Prospect Park West to 25 miles per hour and retimed the lights to slow the speed of drivers. Mayor Bill de Blasio announced earlier this week that a multi-agency working group will release a report in February detailing safety measures to prevent traffic fatalities, including the use of reduced speed limits. Suddenly the whole world is talking about income inequality. But, as this debate goes on, it is beginning to look as though the thing is being misconceived. The income inequality debate is confusing matters more than clarifying them, and it is leading us off in unhelpful directions. Second, it leads to ineffective policy responses. If you think the problem is “income inequality,” then the natural response is to increase incomes at the bottom, by raising the minimum wage. It's not just New York City that'll be treated to new bike lanes in the near future: today, Governor Cuomo announced he'll be allocating $67 million in funding to build more bike and pedestrian paths across the state. We'll be getting almost $15 million for specific bike lane projects (see below). The funding aims to bolster 63 bicycle, pedestrian and multi-use path transportation enhancement projects statewide, covering about 80 percent of the cost of each State DOT-helmed project; the rest of the funds will be covered by a project sponsor. And beyond new bike and pedestrian facilities, projects will focus on adding more accessible sidewalks, improving access to public transportation for pedestrians, and the rehabilitation of unused railroad corridors for trail use. "We are modernizing New York State’s transportation system while making it safer,” Cuomo announced yesterday. “From building new facilities for bicycles and pedestrians to supporting historic highway programs, these projects will provide new tourism and recreational opportunities for New Yorkers and visitors. We will continue to upgrade New York’s infrastructure to expand tourism and economic development while improving our communities." New York City will receive $14.8 million in funding, which will support projects like the adding bicycle and pedestrian lanes on the Pulaski Bridge (FINALLY! ), the Brooklyn Waterfront Greenway-Gowanus connector and an expansion of the Hell Gate bridge's pedestrian and bicycle paths. 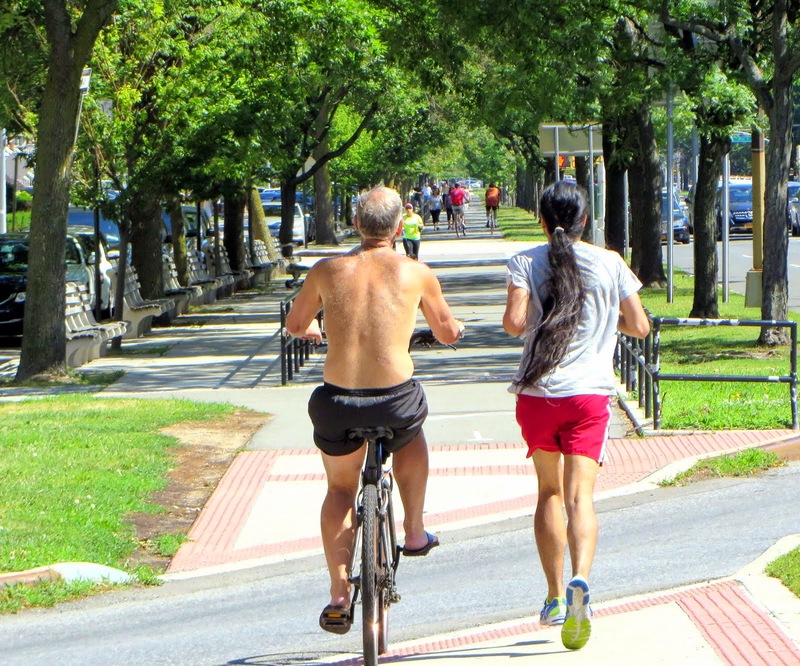 Dozens of bike and pedestrian initiatives on Long Island, in Westchester and Rockland Counties and upstate will see an increase in funding as well. Click here for a breakdown of the NYC allocations. Local leaders are unimpressed by the decision to include Mill Basin, Marine Park, and Canarsie in a program that will invest more than $16 million in the area’s vital infrastructure to make it more storm-resistant, because residents will first have to put their mouths where the money is. Azeez Alade had a plan. He went into the championship game against teammate Alex Ostrovskiy with a move in mind that he was so sure that would work that he couldn't wait to use it. He methodically played his game, slowly setting up the move, but when the time finally came to execute it he realized that he had fallen into a trap. "His thought process is incredible," Alade said of Ostrovskiy. "When he plays, he plays very solid and safe, but there is always a trick. In my game, I wanted to play this one move so badly, but he set a trap for me and I realized that it would have lost almost immediately. I thought it was such a perfect move, but he lays down so many traps that when you step on one it's over." That's what Ostrovskiy likes to do, he sets traps and waits for opponents to fall into them. It's a strategy that he used on Sunday when he took first place and led Edward R. Murrow High School's chess team to victory at the 48th Greater New York Scholastic Chess Championships at the Brooklyn Marriott. Hundreds of students from both public and private high schools from in and around New York City gathered at the Brooklyn Marriott Hotel in Downtown Brooklyn on Sunday to participate in the 2014 New York City High School Chess Championship.Hundreds of students from both public and private high schools from in and around New York City gathered at the Brooklyn Marriott Hotel in Downtown Brooklyn on Sunday to participate in the 2014 New York City High School Chess Championship. Brooklyn's totally out of your league now. The hot borough continued to show signs of strength at the end of 2013 in both the sales and rental markets, according to multiple reports released on Wednesday. The median price of a Brooklyn home reached $570,110 in the fourth quarter, up 11.2% and marking an 11-year high, according to Douglas Elliman. Sales surged 21.2% to 1,752. At the same time, the median rent in North and Northwest Brooklyn rent rose about 1% in December to $2,660, and rents in certain must-have Brooklyn neighborhoods soared to new heights. Bushwick led the way, with the average rent in the neighborhood jumping 8.2% in December to $2,005, according to a report from residential real estate firm MNS. "If you have to pick the strongest housing market in New York City, rental or sales, Brooklyn seems to have both," Jonathan Miller, CEO of appraisal firm Miller Samuel, which compiles the Douglas Elliman reports, told the Daily News. Supply in Brooklyn is scarce, creating frustration for buyers and renters, brokers said. Sales inventory dropped nearly 28% in the fourth quarter. "We've had bidding wars on rentals," said Michael Guerra, managing director of Douglas Elliman's Brooklyn division. "We have people anxious to buy in Brooklyn, but they haven't found something that matches their criteria." Demand is strong across the board. "Sunset Park, Brooklyn Heights, Park Slope, you name it," Guerra said. "Bedford-Stuyvesant is unbelievably hot now." "Brooklyn has emerged as one of the best rental markets in the country," added MNS CEO Andrew Barrocas. Brooklyn is chugging ahead as Manhattan's notoriously expensive rental market is easing. The median rent in Manhattan fell 1.6% to $3,100, according to Douglas Elliman. The gap between Manhattan and Brooklyn is now just $440 - it has been hovering from about $300 to $450 since the fall. Back in 2008, the gap was closer to $1,100. "Prices are down and inventory is up, so all in all now's a great time to be in the market for a new apartment," in Manhattan, said Citi Habitats president Gary Malin. Manhattan and Brooklyn are much poorer than you think. So how can anyone afford to live there? New York City census data: Manhattan and Brooklyn are much poorer than you think. Measured by median income, Manhattan and (especially) Brooklyn are much poorer than you think. Manhattan’s median annual household income is $66,739, while Brooklyn’s is a mere $44,850. Its less fashionable neighbor, Queens, outearns Brooklyn at $54,373 per year. New York City’s most suburban borough, Staten Island, is also its richest, with a median household income of $70,295, while the suburban counties surrounding New York are all richer than any of the boroughs. Meanwhile, the cost of living is astronomical in Manhattan, where the median monthly rent is $3,100; it’s $2,800 in the gentrifying northwestern quadrant of Brooklyn. So how can so many relatively low-income people still live in these areas? The answer has to do with the peculiarities of New York’s housing stock, demographics, and history. Here are the main seven factors. Gotham’s new mayor sounds like François Hollande, and he risks similar results. A Developer Is Mourned and Vilified in Brooklyn.